CN Brown Energy customers earn Big Apple Rewards. Stop by a Big Apple store to get your tag and start earning rewards today! Already have a tag? Register it here. Earn rewards with each purchase! If you purchase 8-13 gallons, you'll get 50¢ off your next in-store transaction. For purchases of over 13 gallons, you'll save 75¢ on your next store transaction! Swipe your loyalty card with every purchase to be automatically entered for a chance to win exclusive giveaways like concert and sporting event tickets, electronics, and Big Apple gift cards. *Excludes purchases of alcohol, newspapers, Lottery, gift cards, bottle deposits, and MDA fundraisers. The more you buy, the more points you earn! 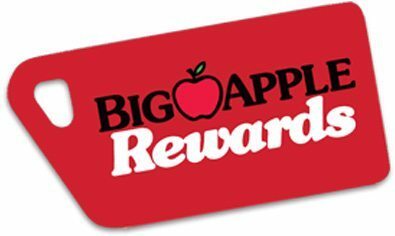 Activate your tag by swiping at the Rewards printer by the cash register, or by visiting BigAppleRewards.com. Earn points with every purchase. Club participation is automatically tracked. At the Pump — swipe your tag on the circular audio unit attached to the pump while fueling. In Store — Swipe your tag at the Rewards printer by the cash register immediately after paying for your transaction. Download our mobile app from the iOS Apple Store or GooglePlay to track your rewards and special offers. You can also check your Rewards at the Rewards printer at any Big Apple store. They’re located by the cash register in every store! Rewards are redeemable at your next Big Apple store purchase. Multiple Rewards coupons may be used in one transaction. Fuel coupons must be used within two weeks of issue date, while club and points coupons are valid for one month from issue date. Coupons cannot be redeemed for cash.